So the advertisers and branders have been having a field day in the run up to the Olympics with every conceivable product having some tie in. One such one is the current British Airways ad that has a BA plane appear to move through various London streets and landmarks before appearing to enter the stadium. All well and good but there is a clever little gimmick whereby you can go to the website, stick in your postcode and the advert replays but this time your street (presumably using Google street view) is spliced into the advert. 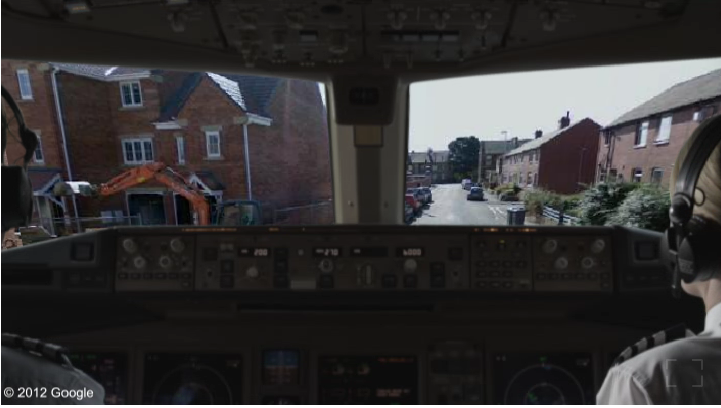 So you see the cockpit view (that’s my street above) and then a view out of the window. The views vary of course depending on what your google street view is like but it’s a clever little trick I think. Made me smile anyway even if it will have no affect whether or not my next flight is on BA. ← The most aesthetic sight in sport ? Confused by the ‘don’t fly’ thing. Energy companies urging us to turn heating down too. What next? McDonalds suggesting we eat healthy and get into sport? I know there are some very strange goings on in the ad world around the olympics. A study in itself.